Page added in May 2018. Photos taken in March 2016. You may wish to see two introductory pages to this section first. 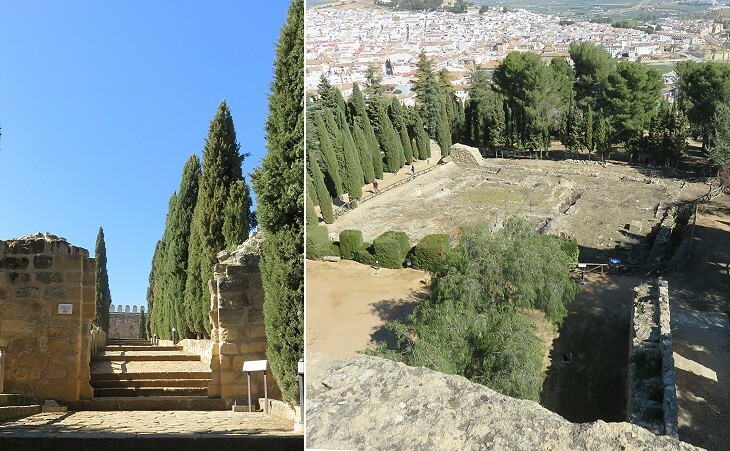 Antequera, "Anticaria" was in the time of the Romans, as now, an important city of the second order. (..) The Peña or Peñon de los Enamorados rises like a Gibraltar out of the sea of the plain. (..) Here, it is said, a Moorish maiden, eloping with a Christian knight, baffled their pursuers by precipitating themselves, locked in each other's arms, into a stony couch. 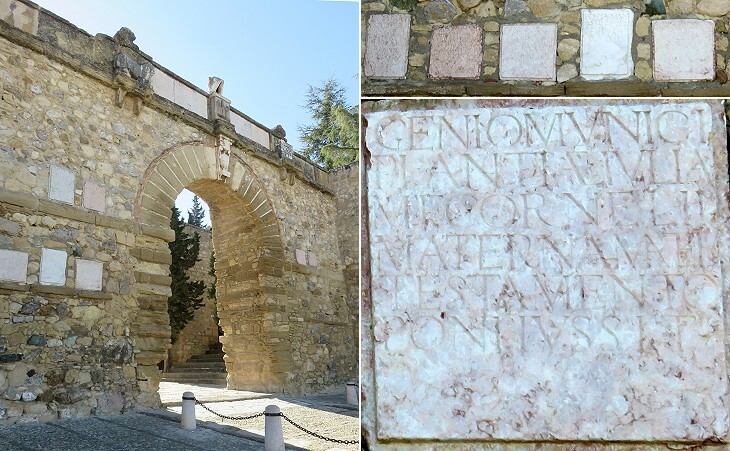 (left) Arco de los Gigantes; (right-above) Roman inscriptions; (right-below) "Genio Municipi(i) Antik(ariensis) Iulia M(arci) F(ilia) Cornelia Materna Mater Testamento Poni Iussit"
The inscription shown above states that Anticaria was a municipium, i.e. it had the status of town. The nucleus of Roman Anticaria was probably under the mediaeval castle. Apart from historical records and some inscriptions there was no other evidence of Roman Anticaria until 1988, when chance excavations at the foot of the hill unearthed public baths which are dated IIIrd century AD. 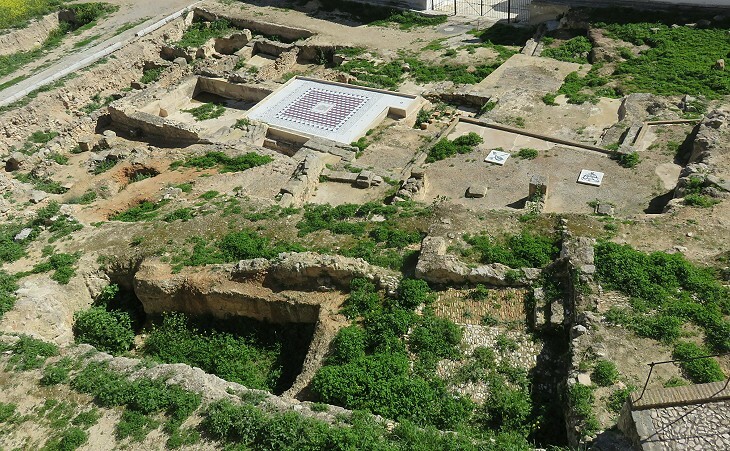 The establishment was small, but it had all the facilities of a typical Roman bath, including three halls (hot, tepid and cold), a pool and a palaestra for exercising. 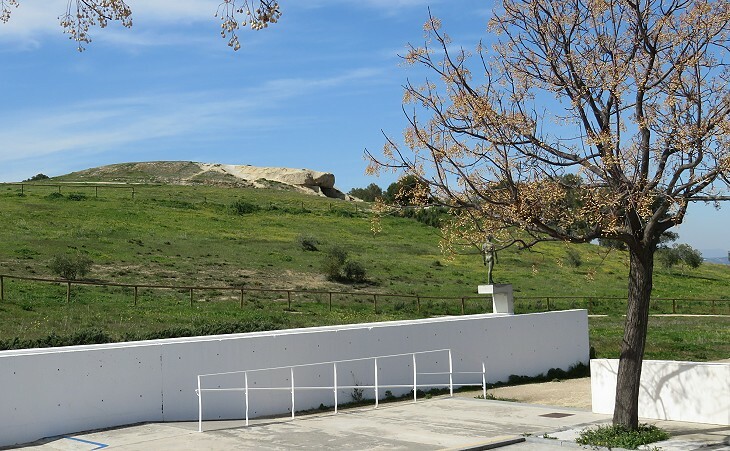 A Roman villa was excavated in 1998 outside the modern town; a number of interesting findings were moved the Museum of Antequera, but the site is not yet open to the public. 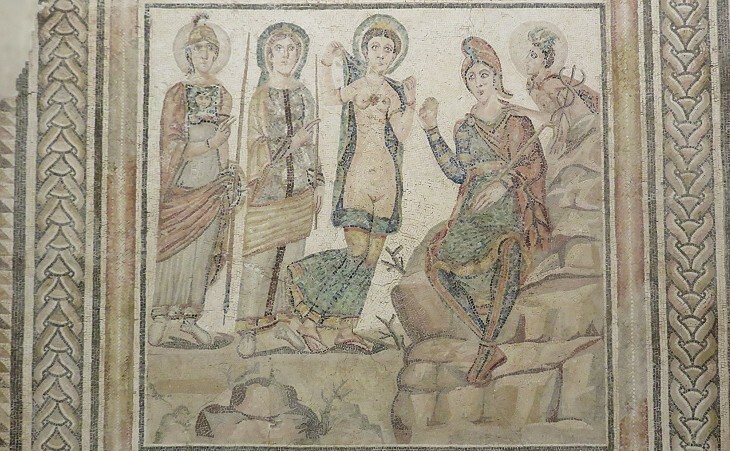 A number of other villas have been found in the environs of Antequera and several mosaics have been moved to museums. In the thickest groves of Ida (..) the grandson of great Atlas and Pleione (Mercury), borne through the air on nimble wings, stood before my eyes. 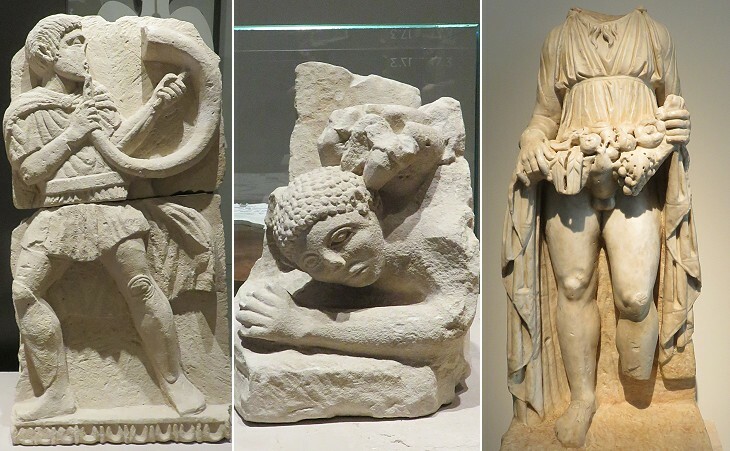 (..) The God stood, and in his sacred hand was a golden rod: three Goddesses too, Venus, Juno, and Pallas, gently pressed the grass with their tender feet. I stood amazed, and a chilling horror raised my hair in bristles; when the winged messenger thus addressed me: "Banish fear; you are appointed the judge of beauty; settle therefore the contests of the Goddesses, and name one who must claim the prize of beauty from the other two." 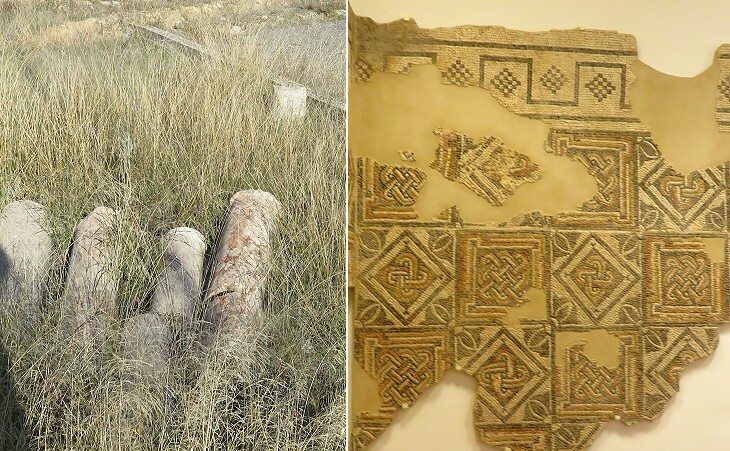 In 1985 other chance excavations unearthed a Roman villa with a very interesting mosaic. It is dated IVth century AD. It depicts a typical pagan subject and it follows the traditional iconography, but the haloes of Mercury and of the goddesses prefigure those of saints. While the most recent findings in the region around Antequera are in local museums or in that of Seville, the earliest ones are in Madrid. The Roman Empire was based on a hierarchy of towns. Basically they all had some form of self-government which was based on the political and administrative structures which existed in Rome. 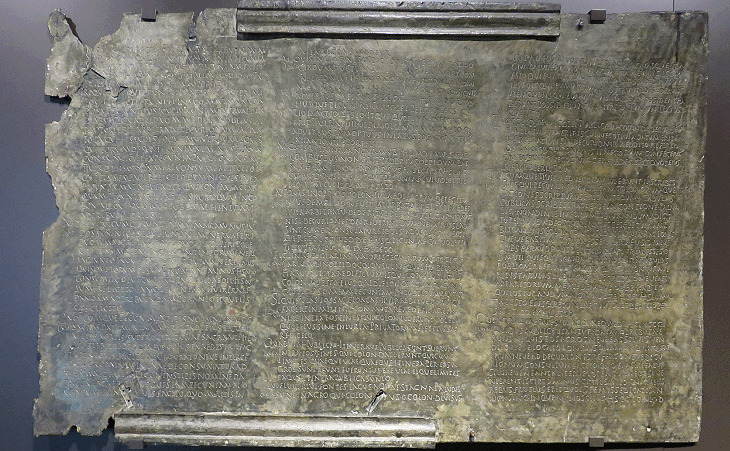 The Lex Ursonensis was incised in bronze during the Flavian Emperors' rule, but it was drafted and approved in Rome in ca 40 BC. It consisted of 140 chapters which provide historians with an extremely detailed description of the political and administrative machinery of a small town (and of its cost). In respect to all duumvirs: each duumvir shall have the right and the power to employ two lictors, an aide, two clerks, two summoners, a copyist, a crier, a soothsayer, and a flutist. In respect to the aediles in the said colony: each aedile shall have the right and the power to employ a clerk, four public slaves in girded aprons, a crier, a soothsayer, and a flutist. In this number they shall employ persons who are colonists of the said colony. The said duumvirs and the said aediles, so long as they hold their magistracy, shall have the right and the power to use the toga praetexta, wax torches, and tapers. As respecting clerks, lictors, aides, summoners, flutists, soothsayers, and criers employed by each of the same all the said persons, during the year in which they perform such services, shall have exemption from military service. And no person, during the year in which they perform such services for magistrates, shall make any such person a soldier against his will, or order him to be so made, or use compulsion, or administer the oath, or order such oath to be administered, or bind such person, or order such person to be bound by the military oath, except on occasion of sudden military alarms in Italy or in Gaul. The following shall be the rate of pay for such persons as are apparitors (civil servants) to the duumvirs: for each clerk 1,200 sesterces, for each aide 700 sesterces, for each lictor 600 sesterces, for each summoner 400 sesterces, for each copyist 300 sesterces, for each soothsayer 500 sesterces, for a crier 300 sesterces; for persons serving the aediles the pay shall be: for each clerk 800 sesterces, for each soothsayer 500 sesterces, for each flutist 300 sesterces, for each crier 300 sesterces. It shall be lawful for the said persons to receive the aforesaid sums without prejudice to themselves. 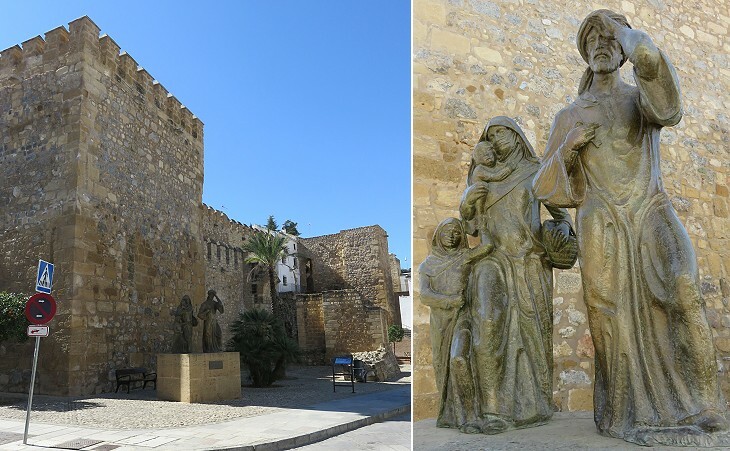 The Arab conquest of Antequera was not a big event, because the town had lost importance and it did not regain it until the XIIIth century. At that time it was part of the only remaining Muslim kingdom in Spain, i.e. the Emirate of Granada. After the 1248 conquest of Seville by the King of Castile, it became a frontier town, similar to Ronda, and its fortifications were strengthened. Early in the morning (May 4th, 1829) I strolled to the ruins of the old Moorish castle, which itself had been reared on the ruins of a Roman fortress. Here, taking my seat on the remains of a crumbling tower, I enjoyed a grand and varied landscape, beautiful in itself, and full of storied and romantic associations; for I was now in the very heart of the country famous for the chivalrous contests between Moor and Christian. Below me, in its lap of hills, lay the old warrior city so often mentioned in chronicle and ballad. (..) Beyond spread out the vega (fertile lowland), covered with gardens and orchards and fields of grain and enamelled meadows, inferior only to the famous vega of Granada. To the right the Rock of the Lovers stretched like a cragged promontory into the plain. After a six month siege, the Castilian troops managed to storm the walls of the city through the only weak point in their defences, now the Plaza del Carmen. The attackers had to fill in the moat, demolish the barbican, breach the walls and harass the defenders from the top of mobile wooden towers in order to be able to finally storm the main tower through the use of a huge wooden ladder.Eventually the population surrendered and were exiled to Granada where they founded the neighbourhood Antequerela at the foot of the Alhambra. Today the area is known as Realejo, but it retains two streets named after Antequerela. 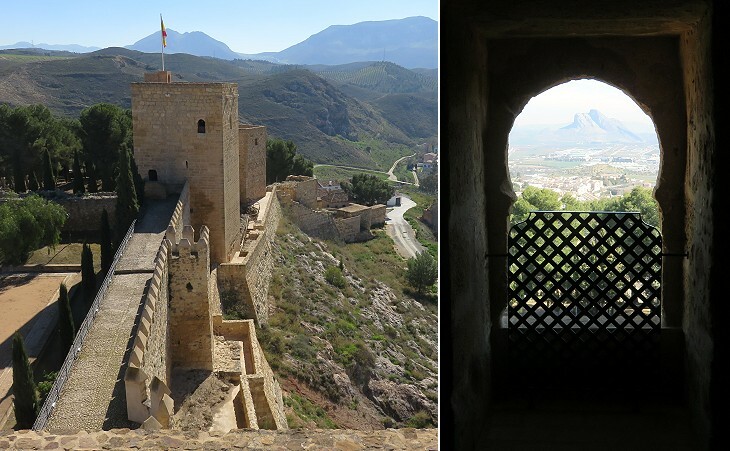 The Castilians, fearing that the Emir of Granada could try to conquer back the town restored and strengthened its fortifications. 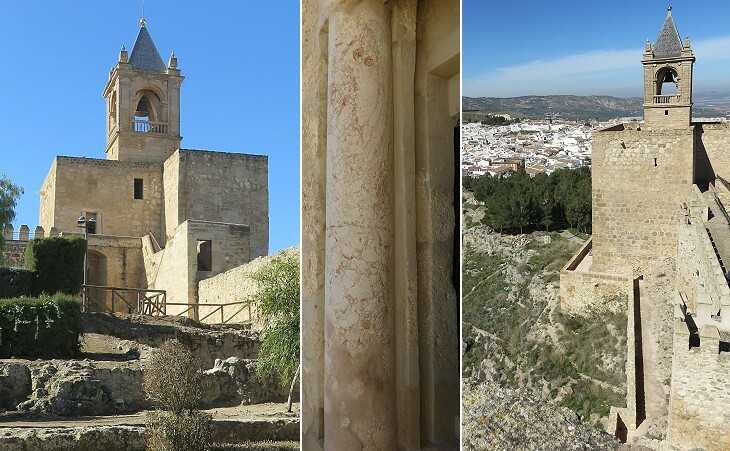 The church was built in 1514-1550 and it is one of the first examples of Renaissance style in Andalusia. Its plundering by the French makes more evident the neat design of the interior. 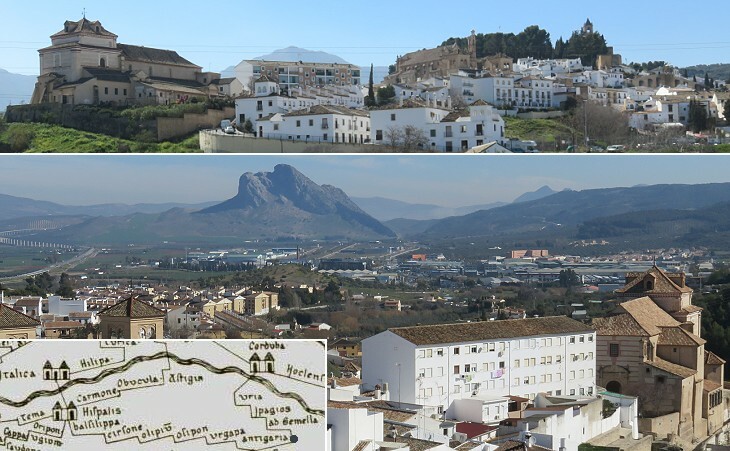 The large size of the building indicates that Antequera enjoyed a period of prosperity in the XVIth century. 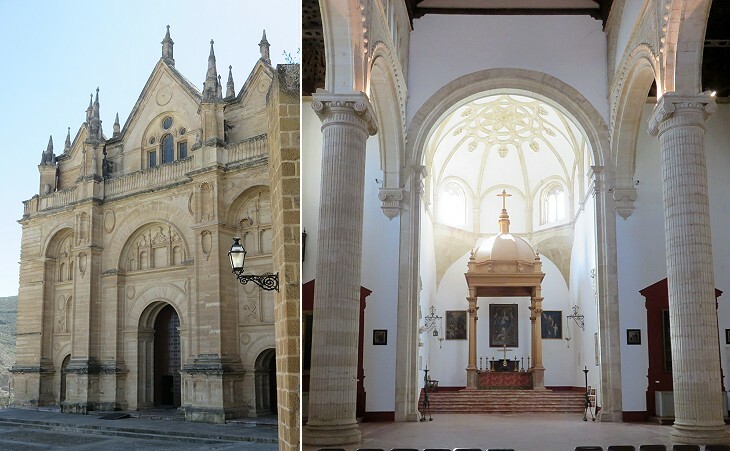 Antequera has many churches because of the presence of monasteries and nunneries. 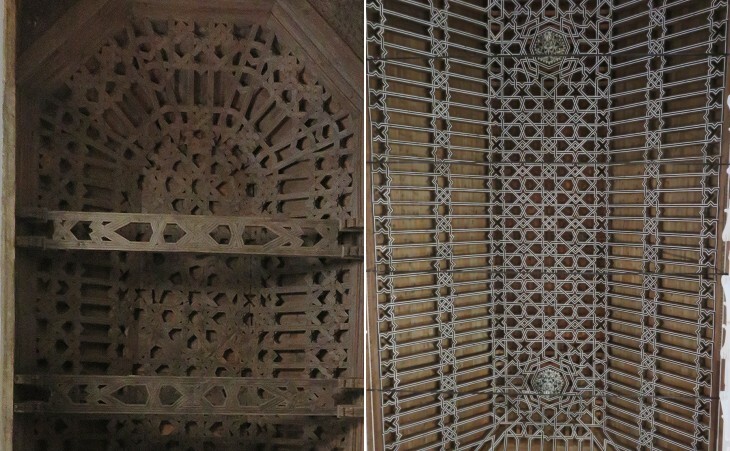 They were generally designed in the style which was in fashion at the time; the coffered wooden ceilings of Santa Maria la Mayor and El Carmen however were built with a technique known as artesonado which derives from models at Granada; such ceilings can be seen in many Christian buildings of Spain, e.g. in the Throne Hall of Aljaferia at Zaragoza. Antequera Dolmens Site - Located at the heart of Andalusia in southern Spain, the site comprises three megalithic monuments: the Menga and Viera dolmens and the Tholos of El Romeral, and two natural monuments: La Peña de los Enamorados and El Torcal mountainous formations, which are landmarks within the property. Built during the Neolithic and Bronze Age out of large stone blocks, these monuments form chambers with lintelled roofs or false cupolas. These three tombs, buried beneath their original earth tumuli, are one of the most remarkable architectural works of European prehistory and one of the most important examples of European Megalithism. 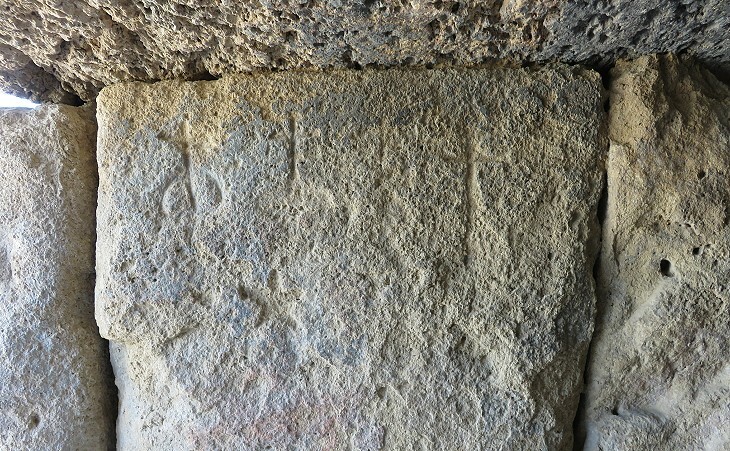 An interesting aspect of Dolmen de Menga is its orientation towards Peña de los Enamorados, which indicates that the mountain was regarded as a holy site. 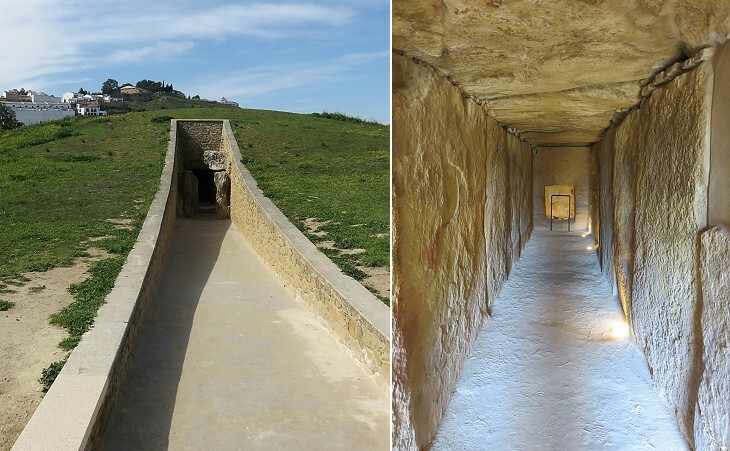 You may wish to see the megalithic tombs of Mycenae and the corbelled cryptoporticus of Tiryns which were built with techniques similar to those employed at Antequera. Return to the introductory pages.